The Gentoo Release Engineering team proudly announces the release of Gentoo Linux 2006.0. Gentoo Linux 2006.0, the first release in the 2006 series, represents improvements across many architectures since the 2005.1 release. 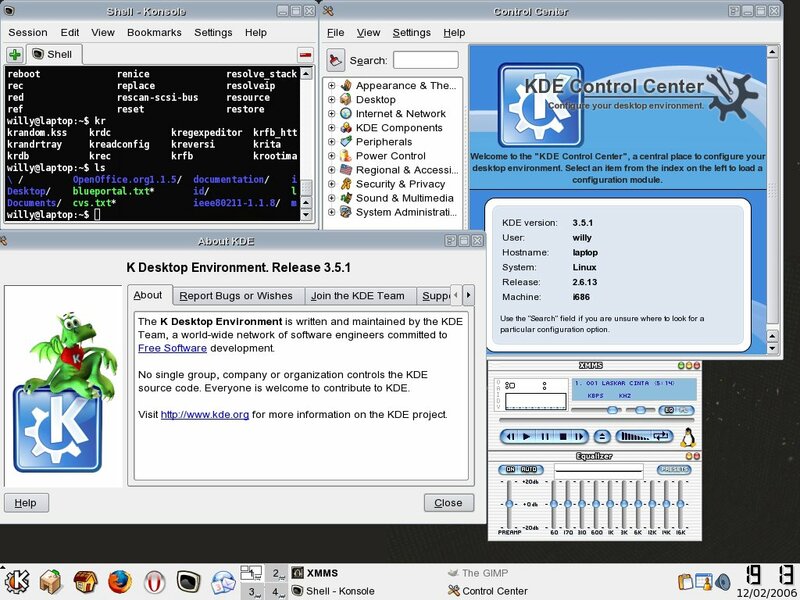 Major highlights in the release include KDE 3.4.3, GNOME 2.12.2, XFCE 4.2.2, GCC 3.4.4 and a 2.6.15 kernel. This is also the first release with the Gentoo Linux Installer officially debuting on the x86 LiveCD, which will fully replace the Universal and PackageCD set. The LiveCD also features a fully-fledged Gnome environment. Later releases will include KDE support as well as a new LiveDVD. The PPC64 team has made significant improvements in its release media. IBM's hardware donation to the team greatly helped this and ensured a smooth release. The CDs feature 64-bit kernels and 32-bit userlands rather than the previous pure 64-bit environment. Optimized stages are available for the G5 and POWER5 processors, making Gentoo the first distribution compile time optimized for the POWER5 processor via a power5 profile. The new release includes an experimental CD with full framebuffer support for dual-core G5 machines along with thermal management features. This makes Gentoo the first to market with release media with this level of support. PPC and PPC64 profiles received further reorganization. They now match those of other 32/64-bit architectures such as SPARC and MIPS, unifying the look of the tree and allowing easier creation of specific profiles (for example, for server use) in the future. The PPC discs improve support for newer Apple laptops such as the last series of PowerBooks, which 2005.1 did not support, and feature improved OldWorld support with BootX on the universal CDs. The PPC team now produces the PackageCDs in a G4 and a ppc-generic configuration, especially useful for older and slower machines. The Hardened team is pleased to release both 2.4 and 2.6 kernel targeted stages for the x86 platform. The previously experimental non-multilib AMD64 stages are now part of the 2006.0 release, while Hardened Gentoo with multilib on AMD64 has become possible and the team is releasing experimental stages. The 2006.0 AMD64 release moves EM64T support out of the experimental realm. The InstallCDs feature support for NVIDIA SATA and for SysKonnect Yukon2 network cards as well as the inclusion of 32-bit Java Support. An experimental LiveCD is also available, featuring the Gentoo Linux Installer. The Alpha team now provides split NPTL profiles as part of the 2006.0 release -- NPTL must use a 2.6 kernel, and those who require a 2.4 kernel or do not wish to enable NPTL can use the no-nptl subprofile instead to not take advantage of the new threading model. Stage tarballs are now provided for both variants, and the InstallCD provides both 2.4 and 2.6 kernels. SPARC has moved to GCC 3.4.5 from the older 3.3 series and also to glibc 2.3.5 from 2.3.3 -- the profile features a 2.6 kernel and headers. However, this feature remains experimental and the SPARC team built the release media with the 2.4 subprofile. Testing from SGI Quality Assurance allowed the IA64 team to update its InstallCD to boot on SGI Prism machines. Gentoo Linux is a community-driven project committed to producing a high-quality open source distribution; more information regarding this release, such as detailed release notes will be available on the Gentoo Release Engineering team's project page. Nothing special happened today. I did nothing today, since my uncle and auntie went to church, so i had to stay at home. I just defrag my Windows filesystems and do monthly virus scanning on my laptop (it's just a routine check, since i always update my virus database, so i'm sure that there were no viruses on my laptop). It took about an hour and half to finish the full scanning. Today i visit a lot of places in Jakarta. Some of them are new to me and it was a great place. Let's start the journey. At mourning, i went to ITC Permata Hijau and directly go to Carrefour to buy some daily needs, such as soap, shampoo, toothpaste, toothbrush, etc. I went there with my auntie and my sister, because i was staying at my auntie's house since yesterday (my sister and her friend pick me up at 9 PM last night). We shopped for about 1 hours and then we got home at 11.30 and my sister phoned her friend and he got here at 12.15 (i guess, since i didn't watch the watch. I'm busy reading Harry Potter 6, which i bought last month, but i just get the change to read it now, since it's on my auntie's house since it was sent last month). At first, my sister told me that we were going to Kelapa Gading Mall, which is located in North of Jakarta. It was nice, since i have never been there before (i have been to Artha Gading Mall, though). But we didn't park at Kelapa Gading directly, instead, we parked at La Piazza (the parking area's height was so short. I guess that the management was hoping that people that come to La Piazza would always use Sedan-like cars), the backside of Kelapa Gading Mall (I just found out that Kelapa Gading has 3 building which was directly connected each other, so it was a huge mall). We had lunch at Taliwang for about 45 minutes and then we start to enter Kelapa Gading I at the movie theater. We wanted to watch Lord of War at 3 PM, but we are late, so we decided to watch the second session at 5.15 PM. After buying the tickets, we go shopping at Kelapa Gading (i don't know what building we were into, since there were no sign at all). I almost bought a nice shoes at Planet Sport, but since there was small defect and there were no other stocks in the warehouse, i decided that i didn't buy the shoes and i'm going to try to find the same product in Taman Anggrek Mall (i hope the product is available). After walking for about two hours, we went to the movie theater to watch the movie. I watched Lord of War with Nicholas Cage as the movie star. It was good, but not not the best movie. I wanted to see Firewall, but since i have promised with my friends at the office that we will see that movie next Saturday, we decided to watch Lord of War. The film ended at about 7.20 PM and we went to parking area to go the restaurant, but after a second thought, we won't go to the restarurang, but we will eat something in La Piazza instead. La Piazza has the same consept of Ci Walk (Cihampelas Walk) in Bandung, but with larger area and places. It was a good place to take a picture, but unfortunatelly i didn't have any digical camera anymore. If i do, i would bring it and take a picture with La Piazza as the background. It would be great picture. I shall upload it here also and in my Friendster's account as well. After having dinner, we went back to my house and i phoned my girlfriend for about one and half hour while watching a football match, between Chelsea and Portsmouth. When i ended my call, i started to continue reading Harry Potter. I have reached fourth chapter (it consist of 816 pages and i have finished 1/8 of it). I will continue with it tommorrow and in my spare time. Finally the latest stable kernel (2.6.15.4) is running at my Slackware. Thanks to Shilo (whom i met from LinuxQuestions) who has gave me a guidance to install the latest kernel to Slackware system. We only met via email, but his steps was working perfectly (also the warning and error messages). At first, there were an error related to ALSA and it's exactly what Shilo had told me. I tried to change the permission for /dev/mixer and /dev/dsp but they weren't there. So i recompiled the kernel again (as suggested by Shilo) by customizing processor architechture and also including all ALSA modules. After i reboot, the error messages still exists, but i can hear my audio files again, since the ALSA packages has been loaded. Now, the only problem is when i connect to the network at startup, DHCP is started before the udev daemon started, so it can't write any file to the systems. Next error message was the rc.wireless which should be called from inside rc.inet1. But since i have Centrino-enabled laptop, i didn't need the script again, so i disabled it and the error messages were reduced. For the next few days, i'm trying to test my new system. Hopefully everything works fine as i expected. Let's enjoy weekend by hacking Slackware. Credit goes to Patrick Volkerding, Piter Punk, and Shilo. Some of my friends have started to make a new blog account and fill their website with blogs. It's not a new trend, since blogging has existed since last year (or perhaps more), but the popularity of blogging in Indonesia has just started lately, when people started to realize that they can express their mind and thought via blog. They can write anything they like or dislike from friends, food, places, etc. Up to now, i haven't been able to upgrade my kernel to 2.6.15.3. I have tried to do the same thing when i upgrade to 2.6.13, but the new 2.6.15.3 kernel has new features which need some changes in the startup scripts and also new packages also, such as udev and sysfsutils (unfortunately, it's not backward compliant with the previous udev version, so when you decided to use this kernel version, you must have a backup of your previous udev, just in case it fails). I ended with a read-only filesystem, just the same sympthoms with some people has had in LinuxQuestions. Some people tries to use Piter Punk's packages which is available in his website, and some of them were successfull, but when i tried it, it didn't work on my system, ended with a same sympthoms. I look his website again today and i found out that he already updated his packages. I will try to look for it tonight or perhaps at weekend, where i have some spare time to hack my Slackware. I'm so excited to use the newer kernel, since most people said that with newer udev, you won't need to use hotplug anymore, so it will boot faster. * Fixed drop-down list problem affecting Bloglines subscription sorting. * Replaced expired certificates from TrustCenter. * Solved status bar issue described in Secunia Advisory 17571. * Implemented stricter handling of the Online Certificate Status Protocol (OCSP). * Fixed problem with missing keypresses when switching between applications. * Fixed GDI leak issue with favicons causing slowdowns and crashes. * Fixed Gmail loading problem. Today, my colleague, Rudi Theunis will have his marriage ceremonial at Bethel Church and at night, they will hold a celebration party at Angke Restaurant. It will be a happy event, since they (Rudi and Vina) will not be 2 again, but 1 (just like Spice Girl's song "2 becomes 1"). They will start to build a new life and new family together. We, all the QnAp Asia staffs congratulates you and wishing you all the best for your new life and family. Who will be next?? Good news for GNOME fans (unfortunately, i'm not one of them), the next GNOME release, GNOME 2.14 will be released in March, 14 (if no other delays). For you who wants to peek inside GNOME 2.14, please take a look at Davyd Madeleys's page where he put a bunch of screenshots in his page. I see that GNOME has improved so much from the last time i used it (i don't remember what version that i used last time). It's now smoother and also customizeable (though i still prefer KDE for more flexible customization). OpenOffice.Org 2.0.2 will arrive soon and the first RC has been available from several mirrors and also in the download central for the snapshot version. Too bad it hasn't include the changelog or release note for this version just as they did in previous release. We are hoping that the final 2.0.2 will not take so long to be public consumption. As usual, the RC is not intended for production deployment. Users are suggested to use 2.0.1, which is the latest stable version up to now for production level. If you are eager to test what has been changed or something new in 2.0.2, please try this release and report as many bug as you can find to QA and hopefully they will fix it in the next RC or perhaps in the final version of 2.0.2. I faced another problem when i wanted to start a new module. I'm trying to find a documents which explains how to make a blinking text, but i couldn't find it anywhere (even in Microsoft's MSDN page). Actually there are several documents in MSDN that explains about this, but the documents itself are not clear. It's mentioned in this and this, but up to now, i couldn't find the dll file required and how to access the enumeration. Does anybody has a solution for this?? 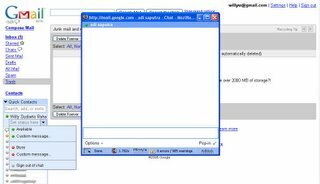 Google has integrated their Google Talk network into GMail, so users doesn't need to install Google Talk anymore (it's usefull if you are in a public area, such as Internet Cafe). You only need to login into your GMail account and then look for the left side of your window. 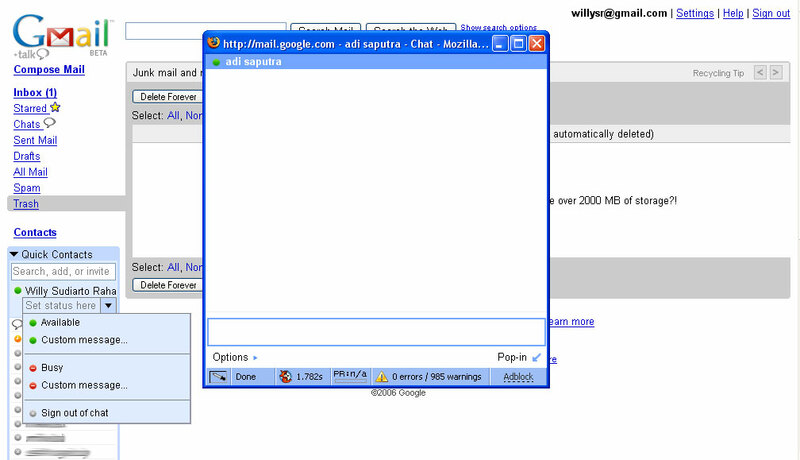 You will see new textbox which is the same with Google Talk's interface. You can set up your status (it's on by default if you logged in), or start to chat with others by clicking their account. Your message will be a pop up message in your friend's PC (if he/she has logged in their Google Talk account). Not only the known account you can chat with, but with others also as long as they have GMail account. Just hover on the email title and a new splash screen will appear along with a button to start a chat session. Very usefull tricks to have a quick conversation. Finally i made an update of my Slackware system with a brand new version of KDE, KDE 3.5.1 which has been released several months ago, but i haven't installed it yet since there was no official packages from Patrick Volkerding. But now it has changed. The official packages were released yesterday and i managed to download them all with other packages as well (it took me about 6 hours to download them all and the size was about 650 MB, including the kernel packages also). You can see my desktop now running KDE 3.5.1 on the screenshot. I haven't seen all the changelogs in the KDE's website, but as far as i seen, the visual appearance in new look are fantastic. If you hover on an application on the kicker, it will display a similar view if you hover on the quicklauncher. The virtual desktop has just got better and one of the most improvements are the Super Karamba application which has been integrated since KDE 3.5. All i have to do now is to download a new theme for Super Karamba and start updating my desktop again. Today, i will have a mass package updates on my Slackware system, since there has been a bunch of updates throughout the Slackware development process in order to fix some bugs and updated the package needed to get the expected result (could be improvement, typo fix, or even security fix). Some packages were added, some were removed to pasture directories, and the rest will need to be rebuild in order to satisfy the changes in other packages. I know it will be a hard night and i don't know whether i can finish all the upgrades process tonight, because i have had several days trying to get the new kernel installed, but it wasn't a successfull processs, so this time i will read the changelog carefully and hopefully, everything will went well and by tommorrow i will have a newer Slackware version with all the packages are updated from the slackware-current version and also improved UI look (Thanks to Patrick Volkerding who finally released KDE 3.5.1 version on Slackware). I have been waiting for this package (KDE) for some time, since i have had a bad experience by using the Slackware package in KDE's official website. I'd better wait for the official packages and here they come. I will not miss the change to experience the latest version of KDE which then be replaced by KDE 4.0 (i don't know when it will be finally released, even though Qt has released their first update version on their Qt library). /usr/lib/libgcc_s.so.1 symlink, needed by Oracle 10g RAC support. a/cups-1.1.23-i486-2.tgz: Recompiled against new OpenSSL. a/cxxlibs-6.0.3-i486-1.tgz: Upgraded to libstdc++ from gcc-3.4.5. against the 2.4.32 and 2.6.15.3 kernel headers. a/gpm-1.20.1-i486-1.tgz: Upgraded to gpm-1.20.1, with many, many patches. better for most purposes anyway, though. may be able to gain root access. d/gettext-tools-0.14.5-i486-1.tgz: Upgraded to gettext-0.14.5 tools. Reported here by: Mihnea-Costin Grigore, penguinista, and ePAc. d/perl-5.8.8-i486-1.tgz: Upgraded to perl-5.8.8 and DBI-1.50. d/python-demo-2.4.2-noarch-1.tgz: Upgraded to python-2.4.2 demos. d/python-tools-2.4.2-noarch-1.tgz: Upgraded to python-2.4.2 tools. kde/k*.tgz: Upgraded to KDE 3.5.1.
l/cairo-1.0.2-i486-1.tgz: Added cairo graphics library for GTK+2. Runtime Environment Version 5.0, Release 6.
n/imapd-4.64-i486-2.tgz: Recompiled against OpenLDAP client libs. n/mod_ssl-2.8.25_1.3.34-i486-2.tgz: Recompiled against new OpenSSL. n/mutt-1.4.2.1i-i486-2.tgz: Recompiled against new OpenSSL. help with the ./configure options). cause commands embedded in filenames to be executed. Claims to fix "a few small security issues". but this one was needed in order to work with the new OpenSSL. n/samba-3.0.21b-i486-1.tgz: Upgraded to samba-3.0.21b linked with OpenLDAP. n/sendmail-cf-8.13.5-noarch-1.tgz: Upgraded to sendmail-8.13.5 config files. n/tcpip-0.17-i486-36.tgz: Upgraded to vlan.1.9 and tftp-hpa-0.41. linked with the ImageMagick shared libraries to be recompiled. Several security issues are fixed in this release. needs to be able to find it. This fixes a DoS issue and some other security bugs. into the standard .desktop directory. possible security bugs with malformed PDF files. This fixes a problem where a malformed PDF can crash Xpdf. Platform Standard Edition Development Kit Version 5.0, Release 6. Thanks to Robby Workman for noticing that CXXFLAGS needed to be set. kernels/test26.s/*: Upgraded to full-featured Linux 2.6.15.3 kernel. pasture/lprng-3.8.28-i486-2.tgz: Recompiled against new OpenSSL. Recompiled ALSA modules for Linux 2.6.15.3. Upgraded to Linux 2.6.15.3 generic kernel. Upgraded to Linux 2.6.15.3 kernel headers. Upgraded to Linux 2.6.15.3 kernel modules. Upgraded to Linux 2.6.15.3 kernel source. # Old bison packages from slackware/d and /extra moved to /pasture. # A few sources may still require these unless/until they are updated. # up sometime, and in preparation for a .0 release seems as good as any. In this week, my job was finishing module 5 and also fixing bugs from other modules. Luckily we had our bug tracker working well (Thanks to BugTracker.Net) and also a great test team which found the defect for us. It had a lot of defect, since we only have less than a week to develop each module, so we only did the basic requirements and the rest will be known when the test team have tested them. They were doing great and they have found some bugs which we didn't expect also, so our product will be better and better each day. We have reached bug #326 up to now, and i think it will increase again, since we still a lot of modules to be done in the future. Today i supposed to buy a gift box for my girlfriend at Taman Anggrek Mall with Adi and Budi, but since they have an urgent call that should be solved as soon as possible, so they just dropped me at Taman Anggrek and i went there alone. I bought a gift box at Mai Choise and then, i look at Gunung Agung book store and also in Spektra (also a book store, but most of them are imported book). I saw a good C# book, "Programming in C#", but it was so expensive and out of my outcoming budget, so i didn't buy it. After that, i decided to go back. At first, i planned to ride a bajaj, but in second thought, i want to try if i walk from Taman Anggrek to my place. So that's it, i walked from Taman Anggrek to my place on foot and it took me 15 minutes to reach my place. I took a bath as soon as i got home and prepare my gift and then take a rest. "A gravatar, or globally recognized avatar, is quite simply an 80×80 pixel avatar image that follows you from weblog to weblog appearing beside your name when you comment on gravatar enabled sites. Avatars help identify your posts on web forums, so why not on weblogs?" I had a defect on my program which i couldn't solve for two days. It's only a small defect, but it's impact was huge, so if i fix it, it will bring a new defect and both of them were in a different situation, so it was hard to solve the problem, but finally i got it fixed it today, after packing my gift to my girlfriend for the next valentine day. I added some new event, change some code, analysing and tracking each steps, and finally i made the code fix. I will test it further and tomorrow i will apply this code to our code management system in the office. Let's hope it doesn't cause another issue, since after this bug is fixed, i will start focusing on another module, which is harder and have a different requirements and specifications. After that, i watched some DVDs, but unfortunately, some of them were bad and i couldn't get the plot correctly, since it was badly translated, or the storyline wasn't clear. I managed to watch all of them but only some of them which i saw until the end of the movie. We all know that KDE and GNOME are the most used desktop manager in GNU/Linux platform. Both of them provide an easier way to maximize your desktop utilization in order to improve your productivity while using GNU/Linux as your primary operating system. Right now, KDE has reached KDE 3.5.1 while GNOME has reached GNOME 2.12 and both of them are working hard to get to the next level, KDE 4.0 and GNOME 2.14. We shall wait for the upcoming version that will take our desktop one step further. Today i saw Iwan Setiawan's blog and there i saw a nice picture. 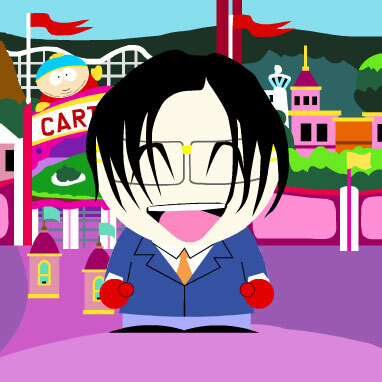 I tracked the source and it was made by using Macromedia Flash in South Park Studio. I already create one also, which can be viewed in the screenshot. It was fun to create such thing, since it can be used to replace Yahoo's Avatar or even uploaded to Friendster or any other public image services. It has so many items, so you can use your imaginations to create a figure that looks like your personality. The only thing that i expected for the next version (current version is 2) is a feature to save the animated picture into a static format (JPG or PNG), since for now, we can only do some print screen and save it manually. But for now, just take it and reveal your imaginations through this stunning studio. Yesterday, i was suprised by some pop-up window saying that i had to restart my Firefox. That was strange, since i never opened any websites at all. 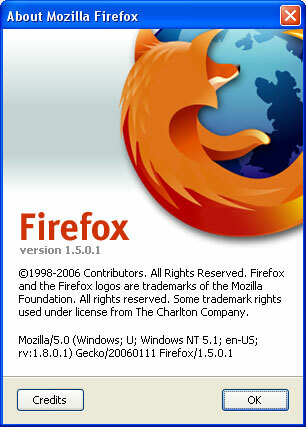 But after i saw the details, i found out that Firefox has updating itself to the latest version, Firefox 1.5.0.1. It a proof that his software update facility is working perfectly, by downloading changed parts of the Firefox's components. Trinity Rescue Kit 3.0 or TRK 3 is a 100% free CD bootable Linux distribution aimed specifically at offline operations for Windows and Linux systems such as rescue, repair, password resets and cloning. It has custom tools to easily recover data such as deleted files, clone Windows installations over the network, perform antivirus sweeps with 2 different antivirus products, reset windows passwords, read AND write on NTFS partitions, edit partition layout and much much more. Trinity Rescue Kit 3.0 is a complete rewrite of version 1.1 and the unfinished 2.0. It ‘s mostly based on Mandrake 10.2 (Mandriva 2005) binaries and heavily adapted startup scripts. Although it requires a bit more startup time than version 1.1, it still is a fast booter(39 seconds compared to 31 in TRK 1.1 on a Compaq Evo D51s, 2.4Ghz) , recognizing even more hardware than ever. It now also has a feature for automatic proxy detection and custom startup environment adaptations. An administrator can configure his LAN (using DHCP and a webserver) so TRK3 can taken advantage of that, making it even more powerful. Apart from that, you can have any computer run a specific script from a local folder (f.i. 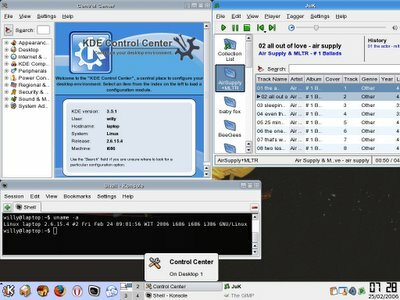 to run maintenance and backups in batch) Where Trinity Rescue Kit 1.1 is looking at around 120.000 downloads so far (and who knows how many CDRs got burned), TRK 3.0 claims to be the most complete, fast to use toolkit when it comes to performing offline rescueing on both Windows and Linux. -vesa framebuffer support: TRK now has limited graphical support thanks to kernel builtin framebuffer support. -full NTFS write support thanks to the captive ntfs project. -more NTFS write support with the NTFS Fuse driver. -virusscan: completely rewritten,this script now has two different engines: the default is to run with the GNU Clamav antivirus which is free for everyone. This is a very good scanner, but the drawback is that it can only detect virus infected files, not clean them. So the only option is to delete them, where most of the time the file is the complete virus. But just to be sure we don ‘t delete anything valuable, a quarantined backup is being made first. The other part of the script uses the free-for-home-users F-prot. F-prot itself is not included in TRK but it gets downloaded from their site. F-prot DOES have the ability to disinfect files if necessary. -ms-sys: This program is used to create Microsoft compatible boot records. It is able to do the same as Microsoft "fdisk /mbr" to a hard disk. It is also able to do the same as Microsoft "sys d:" to a floppy or FAT partition except that it does not copy any system files, only the boot record is written. -PhotoRec: File and pictures recovery. PhotoRec has been created to recover pictures from digital camera memory and it has been extended to recover lost files from harddisk (List of known files). PhotoRec is safe to use, it will never attempt to write to the drive or memory support you are about to recover from. Recovered files are instead written in the directory from where you are running the PhotoRec program.